George H. W. Bush became the 41st President of the United States on January 20, 1989. He had been the Vice President under President Ronald Reagan for eight years already. In his previous political endeavors, he had also served, among other positions, as the Ambassador to the United Nations and Chief of the Central Intelligence Agency. Thus, he was well regarded as a top expert in foreign affairs. But he seemed to be most proud of his experience as the Chief of U. S. Liaison Office in Beijing during 1974-1975, the precursor of embassy in China. 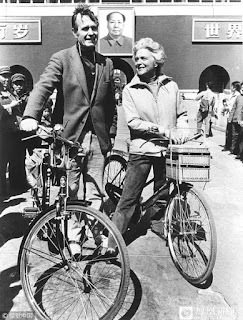 He and his wife enjoyed riding bicycles in the streets and hutongs of that city, gaining first-hand intimate feelings of that mysterious country before her opening to the rest of the world. After his inauguration, Bush quickly planned a trip to Japan, China, and South Korea (using the funeral of Japanese Emperor Hirohito as an opportunity) as his first official working trip as President. This was the very first "pivot to China" attempt by the US government. 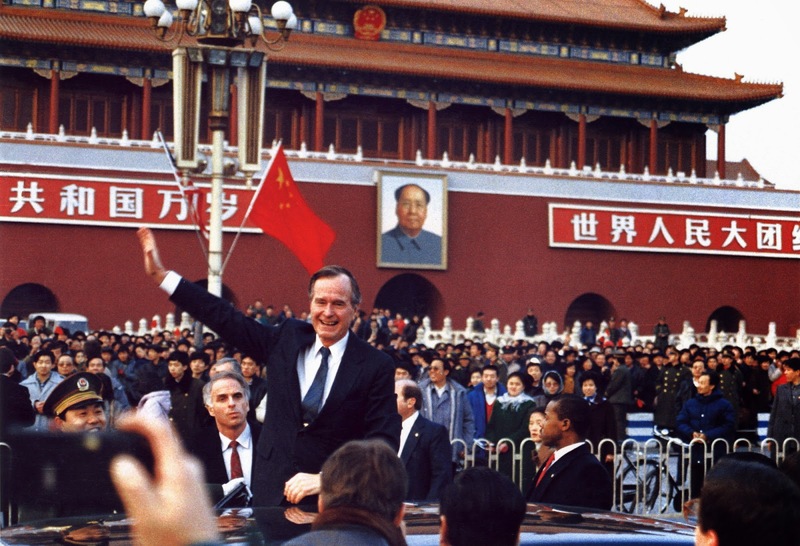 On February 25, 1989, barely a month into his presidency, Bush arrived in Beijing. On the second day of his triumphant return, however, there was trouble. Bush was to host a banquet at the Great Wall Hotel and he had invited many dignitaries in Beijing, including some famous dissidents. Professor Fang Lizhi and his wife Li Shuxian were invited but was blocked by authority from attending on the street outside of the hotel. The couple held a press briefing later that night at the Shangri-La Hotel instead. It was the first signal that government's tolerance of dissident activity was reaching its end. The Bush administration had only muted response to that incident. The sudden eruption of student movement later that year caught Bush by surprise, when his attention was focused in the East Europe. The US government stayed in a low profile during the entire period. After the massacre, while shocked, President Bush quickly decided that his first priority should be to "preserve the relationship" between America and China. Just as the US government was denouncing the brutality, Bush was already seeking private channels to convey his true intention to Beijing. On June 20, while the ripples of the massacre were still apparent, he wrote a secret letter to his "old friend" Deng Xiaoping, delivered through the Chinese ambassador Han Xu (韩叙). Deng Xiaoping quickly responded, and with it started a secret diplomacy between the two great nations. Shortly after, White House envoys, former President Richard Nixon, former Secretary of State Henry Kissinger, and others visited Beijing either in secret or officially, maintaining a viable communication channel. At the same time, Bush was facing tremendous pressure from the American public and Congress to impose tough sanctions on China. The newly formed Independent Federation of Chinese Students and Scholars in America launched a successful and sustained lobbying campaign, which was supported by most Congress members, led by the Congresswoman Nancy Pelosi. They managed to pass a series of legislation aimed to punish China and protect Chinese students in America. Bush also experienced difficulty in securing the release of Fang Lizhi, who had taken refuge in the US Embassy in Beijing after the massacre. He viewed the issue as a huge headache. After a year of negotiations, Fang Lizhi was finally allowed to leave China. When Fang Lizhi almost immediately criticized US government's "double standard" on human rights issues regarding China, Bush and his team were deeply offended. During his four years in office, President Bush oversaw "a world transformed," with fundamental changes occurring in China, East Europe, and Soviet Union. He also won a complete military victory in the first Gulf War. However, his triumph in foreign affairs was no match to a domestic economical recession and was defeated for reelection. 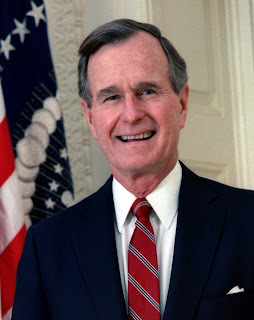 Bush died on November 30, 2018. He was 94.